Serve these fellows piled on top of spaghetti, or smother them in homemade marinara and make a classic ‘meatball’ sub. Tip: Do a little extra prep work for a really special dinner: Make a quick batch of cashew Parmesan cheese (super easy, and needed for this recipe anyway! ), prepare a classic marinara, and/or bake a loaf of rustic bread. In a large bowl, spritz eggplant cubes with olive oil and sprinkle with salt and pepper. Toss to fully coat. Line two baking sheets with parchment paper and spread eggplant cubes on baking sheets. Roast for 20-30 minutes, tossing once halfway through to ensure even cooking. When the eggplant are tender, remove from oven, transfer to a large bowl (do not discard parchment paper), and allow to cool for five minutes or so. Mash the eggplant with a potato masher or pulse a few times in a food processor. Add diced onion and minced garlic to the eggplant mixture and stir together with a wooden spoon. Stir in 1 cup of panko, Italian seasoning, basil, and cashew Parmesan cheese. Taste mixture and add more salt and pepper if necessary. Mixture should be moist enough to roll into a ball but not overly wet -- if it's too wet, add some or all of the remaining ½ cup panko. Scoop out 2 tablespoons or so of the mixture into your hand and shape into ball (slightly smaller than a golf ball). Place on the same parchment-paper-lined baking sheet you used for the eggplant cubes. Repeat until all the mixture is used. Bake for 30 minutes, turning at the halfway point so that sides are evenly browned. Remove eggplant meatballs from oven and let set for 5 minutes before serving over pasta with marinara or in an eggplant meatball sandwich. 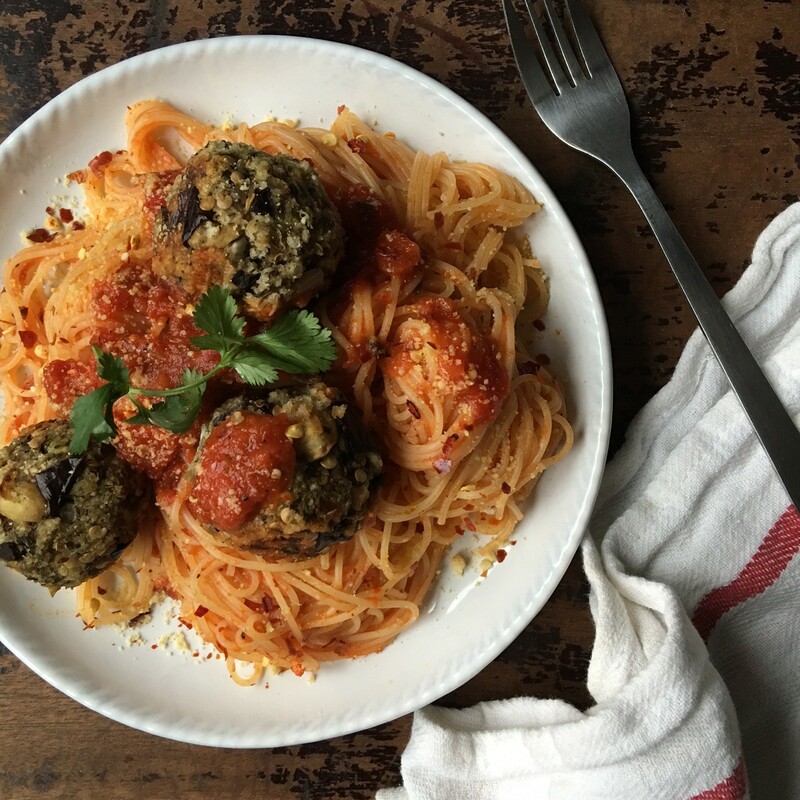 Once baked, your eggplant meatballs will get firmer as they cool. I recommend making ahead of time and reheating them in marinara in a saucepan over the stove when you're ready to serve. Makes around 24. In Appetizers, Main Dishes, Side Dishes. Bookmark the permalink.